The Handmaid's Tale is a difficult show to sum up in just a few words. Just describing the plot of the exhilaratingly horrifying journey into Gilead takes more than a few sentences, as one needs to break down what exactly Gilead is (a totalitarian theocracy ruling over what's left of the United States after a modern-day Civil War), what the titular Handmaids are (a group of subjugated women enslaved by the ruling class and raped repeatedly because of their rare fertility), and why anyone would even want to watch something as frighteningly timely as this (because it's just damn good, that's why). So, when we asked the cast of the award-winning Hulu series to sum up the new season in merely three words on the red carpet at their big premiere, you can imagine they had a bit of trouble. 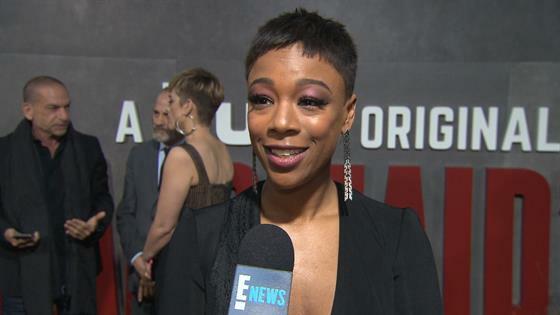 Samira Wiley, who stars as Moira, one of the lucky Handmaids to escape to Canada, was honest about what a challenge this would be for her. "I always am bad at this because I end up just putting three synonyms, you know," she said. "Dangerous, unexpected, and 'Wait, what?!' That." And Alexis Bledel, who won an Emmy for her guest-starring work as Emily in season one and returns as a series regular this year, just flat-out refused to stop at three. "It's brutal. Relentless. A gut punch," she said, before continuing with a smile. "And a wake-up call. And a cautionary tale." Season two, which sees the show going beyond the scope of Margaret Atwood's book after season one's complete depiction of that particular story, ups the ante in terms of stakes and darkness, the cast promised. As if there was ever any doubt. "How much darker is it? A lot darker. We are able to go to some places that we hear about in season one, but we really get to see them in season two," Wiley noted. And it's brutal, man. It's brutal." As star Elisabeth Moss, who took home an Emmy for her stellar performance as the titular Handmaid, June, explained it, the rising terror is a direct response to her willingness to fight back. "I think as June's fight rises, as her resistance capacity rises, the darkness is higher, you know? She has a bigger fight to fight," she said. "The stakes are just much higher this season." However, just because the darkness has multiplied this season, that doesn't mean the underlying sense of hope hasn't increased in turn. "Let's consider this: The longer you repress and abuse human beings, the stronger the impulse to shift the plates of the earth, if you will. I would agree it is darker in the sense that the stakes just keep getting higher," Ann Dowd, who also won an Emmy for her magnificent work as the pious and extreme Aunt Lydia, explained. "However, it's important to note that there's tremendous hope because the resilience and strength and the way these Handmaids attach to life still is quite remarkable, so it is dark, for sure, but it's extraordinary. Truly, it is." For more from the cast, be sure to check out the video above! The Handmaid's Tale's first two episode of season two are available to stream now on Hulu. New episodes drop every Wednesday.